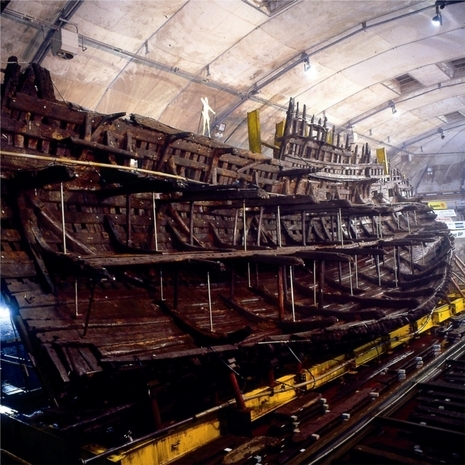 The Mary Rose was one of the earliest ships to carry heavy guns. 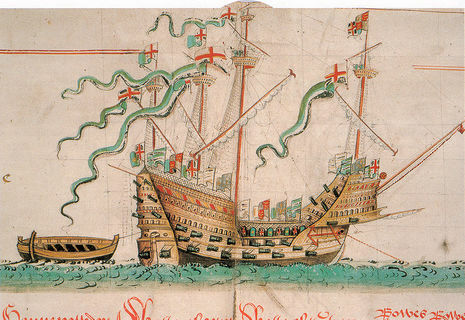 She was a favourite of King Henry VIII and sank off Portsmouth in 1545 during an engagement with a French invasion fleet, in full view of the King, the screams of the men onboard, ringing in his ears. On 19 July 1545, the French galleys advanced on the immobilised English fleet, and initially threatened to destroy a force of 13 small galleys, or "rowbarges", the only ships that were able to move against them without a wind. The wind picked up and the sailing ships were able to go on the offensive before the oared vessels were overwhelmed. Two of the largest ships, the Henry Grace Dieu and the Mary Rose, led the attack on the French galleys in the Solent, but early in the battle something went wrong. While engaging the French galleys she suddenly heeled (leaned) heavily over to her starboard (right) side and water rushed in through the open gunports. The crew was powerless to correct the sudden imbalance, and could only scramble for the safety of the upper deck as the ship began to sink rapidly. As she leaned over, equipment, ammunition, supplies and storage containers shifted and came loose, adding to the general chaos. The massive port side brick oven in the galley collapsed completely and the huge 360 litre (90 gallon) copper cauldron was thrown onto the orlop deck above. Heavy guns came free and slammed into the opposite side, impeding escape or crushing men beneath them. For those who were not injured or killed outright by moving objects, there was little time to reach safety, especially for the men who were manning the guns on the main deck or fetching ammunition and supplies in the hold. 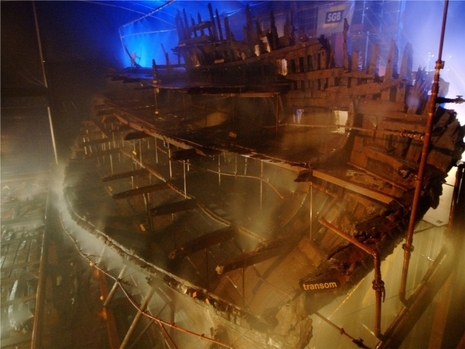 The companionways that connected the decks with one another would have become bottlenecks for fleeing men, something indicated by the positioning of many of the skeletons recovered from the wreck. What turned the sinking into a major tragedy in terms of lives lost was the anti-boarding netting that covered the upper decks in the waist (the mid-section of the ship) and the sterncastle. With the exception of the men who were stationed in the tops in the masts, most of those who managed to get up from below deck were trapped under the netting; they would have been in view of the surface, and their colleagues above, but with little or no chance to break through, and were dragged down with the ship. Out of a crew of at least 400, fewer than 35 escaped, a catastrophic casualty rate of over 90%. 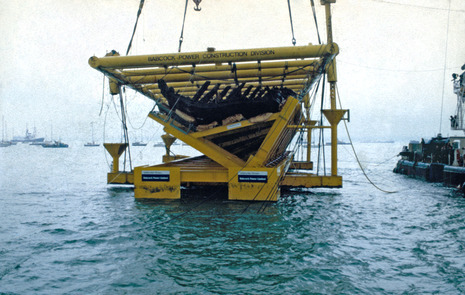 Owing to this indiscipline, he [Sir Peter Carew] records that the Mary Rose sank with the loss of nearly 700 men. 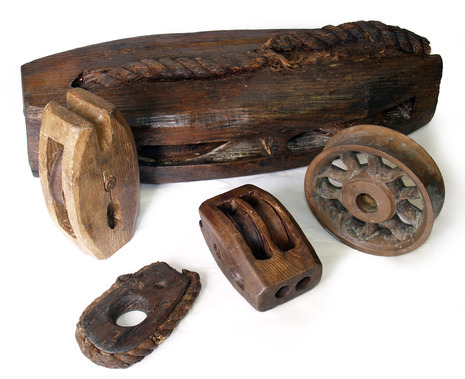 This figure for the complement is extremely unlikely, no other reference gives such a number, and it seems very likely that the Mary Rose was carrying her normal crew of between four and five hundred men when she sank. Neither the vice-admiral, or the captain, Roger Grenville, were among the survivors. Poor Carew got a rather cursory obituary in a letter from Harvel to Paget in September.